Weight: 1.62 ct; size: 9.61 | 7.19 | 4.78 mm; shape: hexagon; colour: light grey; clarity: eye clean; cut: excellent; treatment: none. Very clean specimen; design ‘Hexaelongatis 2’, excellent cut by Tan Pen. Traditionally defined as a fibrous cryptocrystalline variety of quartz. More recently, it has been shown that much chalcedony is a mixture of quartz and mogánite. 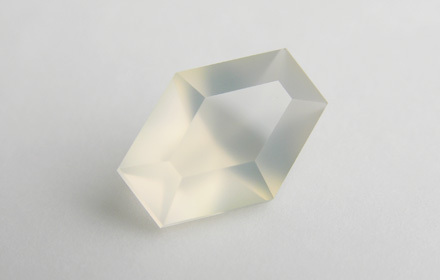 Pure chalcedony may contain trace amounts of silanol groups.